Some poking around Amazon would seem to indicate that A Bear Called Paddington is now out-of-print?! Can it be so!? Looks like you can find it via Kindle or audio book but tracking down a hard copy could prove a little harder. That seems rather unbelievable to me. When I was looking for a picture of the cover art for the book we own (picked up at Goodwill for $0.49!) I found it at Library Hospital which I thought was funny. You can read Sarah's review from 2009 HERE. I learned things about this series of books by re-reading her post. For instance, I was not aware that this is a fifteen book series. I don't know how compelled I feel to read all of them, but the first title was enjoyed to such an extent around here that I don't think anyone would be opposed to reading another. It should come as no surprise on the heels of this post to learn that I had never actually read Paddington Bear. (Jonathan had.) Bookworm1 and I embarked upon this story together and, I think, we both ended up really enjoying it. Usually we read one chapter aloud a day, except when he is really getting into a particular story and asks to read more than that. We took Paddington in two chapters at a day. I was the one calling for reading breaks. If you happen to be unfamiliar with the story, it is about a bear from Darkest Peru who stows away on a ship headed for England. Mr. and Mrs. Brown discover the bear at Paddington station in London and bestowed the name of the railway line upon him. (I grin thinking about The Importance of Being Earnest .) He comes to live with Mr. and Mrs. Brown, their children, Judy and Jonathan, and their housekeeper, Mrs. Bird. Judy took one of his paws. "Come along, Paddington. We'll take you home and you can have a nice hot bath. Then you can tell me all about South America. I'm sure you must have had lots of wonderful adventures." "I have," said Paddington, earnestly. "Lots. Things are always happening to me. I'm that sort of bear." The Brown family soon discovers that Paddington is, in fact, just the store of bear that has lots of adventures. He can't seem to avoid them, even if he tries. Bookworm1 got a lot of giggles out of the scrapes that Paddington got himself and the rest of the family into. Michael Bond, who is also a playwright and screenwriter, writes in such a manner that you are able to easily picture the scenes in the book. You can see Paddington tottering over a store display, or nearly drowning in a bathtub. I laughed at the way that the adults in the book respond to Paddington with exasperation, along with a great deal of love and affection. When he got home he went upstairs to his room and lay on the bed for a long while staring up at the ceiling. He was up there so long that Mrs. Bird became quite worried and poked her head round the door to know if he was all right. "Quite all right, thank you," said Paddington, distantly. "I'm just thinking." Mrs. Bird closed the door and hurried downstairs to tell the others. Her news had a mixed reception. "I don't mind him just thinking, "said Mrs. Brown, with a worried expression on her face. "It's when he actually thinks of something that the trouble starts." We finished this book in just under a week's time, every moment of which was delightful. The chapters are fairly long (being 10-12 pages in length) which can be a bit of a stretch for an early chapter book reader. However, every bit of the book is easy to understand and follow so a younger reader should have no difficulty with it. Even Bookworm2 (age 4) displayed a good bit of curiosity and would come over to look at the pictures and giggled a time or two at Paddington's silliness. The only difficulty I can see in the book is that it is British and so you have to explain the different vocabulary words used for different things. For example: constable, marmalade and queue. (I remember when I first landed in London and someone told me to go stand in a queue. Talk about bafflement! What?) But such things are easy to explain and should in no way deter anyone from reading this story. Sarah gave this book 4.5 out of 5 stars. If I were in the habit of giving my reads stars, I'd likely give this one the same. It's not perfection but it comes awfully close. A Bear Called Paddington is delightful story and we highly recommend it to you! I've never read this one either. WIll keep my eyes out for it though. Paddington out of print? Say it ain't so! I've never gotten around to reading Paddington either, but I thought it was a classic. How could it be out of print??? Sounds delightful, maybe I'll find it in a thrift store. We love Paddington around here! we have all the stories in an illustrated treasury book. The show was pretty good too. Paddington and Corduroy were two bear books that I loved reading to my kids that I don't remember coming across before that time, either. How can Paddington be out of print? ! Holding more tightly to our treasured copy. . .
We've listened to it on CD and really enjoyed it. I read Paddington for the first time as an adult a couple years ago, hope i hung onto my copy. Now i'm hoping for more of his titles to show up at garage sales. Smiled when you mentioned Earnest. I played Gwendolen in high school--probably the favorite part I ever had the privilege to play! 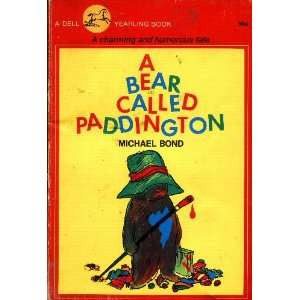 I was under the impression that the book is being published as a reissue under the title of "Paddington," though I could be mistaken. I don't see how the book can be out of print--isn't there a movie scheduled to come out in 2014? You know, I've never read Paddington, although I do think I handed over to my eldest to read earlier this year. :-) I think I need to rectify that!